Pricing has an incredible ability to make your company profitable or broke. The pricing method that you use for your product or service should be chosen based on your company’s Competitive Differentiation Strategy. If you are competing on Convenience, a Cost-Plus pricing method is not appropriate. But, if you’re competing on Price, the Cost-Plus method it is a critical piece of your strategy. 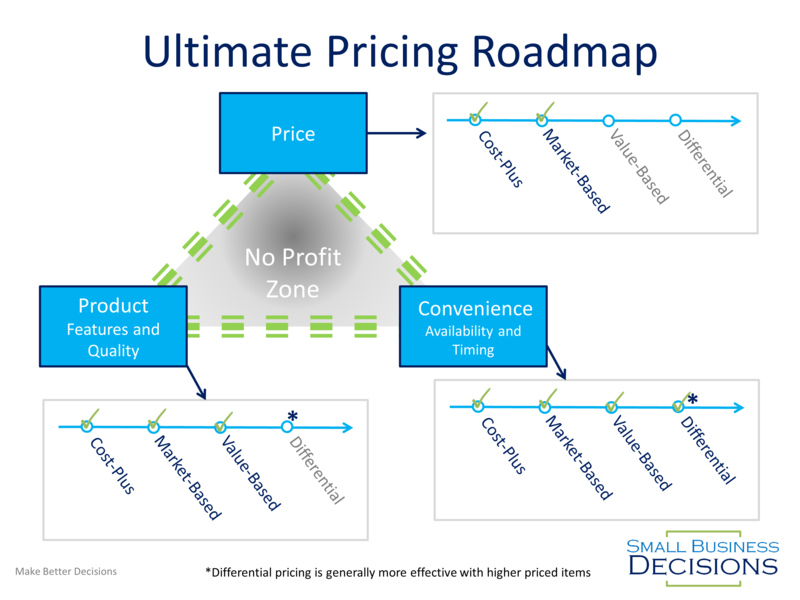 That’s what I’m going to address today: How To Price your Product or Service – The Ultimate Pricing Roadmap. When you are trying to decide how to price your product or service as a business, you can scrounge the web for all kinds of different definitions and methods like Cost-Plus Pricing, Market-Based Pricing, or Value-Based Pricing. But which method should you use in your specific business? We’re going to take pricing from an art and turn it into something more concrete and process-based. Price is one aspect of how to differentiate your product or service. In order to understand what strategies you will use to set price, you first need to decide how you will differentiate yourself from everyone else. You can differentiate on Price, Product, or Convenience. Once you decide, you can use the pricing framework that will match your Competitive Differentiation Strategy. Price differentiation means you are the cost leader. Product Differentiation means that you have one of the best products available on the market. Convenience Differentiation means that you are the easiest to work with and provide the best customer experience. Figure 1. Competitive differentiation framework. The best pricing will be based on which method you use to differentiate yourself from the competition. I have heard so many startups claim that they will be the best in all three realms, but quickly see that they have to choose one or two areas to compete in order to survive. Venture funding and investors can make up for a lack of profitability for a time, but eventually, there needs to be a return for the investment, which means reducing costs or raising prices. I have also heard many salespeople who only try to sell a product based on setting the lowest price. In many cases, that strategy is purely based on being afraid to charge more without realizing that customers will happily pay your more to avoid going to a company with an inferior product or with a reputation for terrible customer service. The ultimate pricing roadmap shows which pricing methodologies fit with the differentiation that your company works with the most. Competing on price and cost uses the fewest pricing methods, but it can be critical to be excellent at mastering these methods because margins are generally much smaller and volumes higher, so accuracy is key. When you get more into the product and convenience differentiation, the more advanced pricing methods become useful since they focus on how to increase the perceived value of your product or service offering as higher than the competition in order to gain a higher price. Highly advanced methods, such as differential pricing are generally more profitable for higher ticket items. Differential pricing can be applied to less expensive products, but the effort/benefit tradeoff may not be there. Figure 3. The Ultimate Pricing Roadmap. 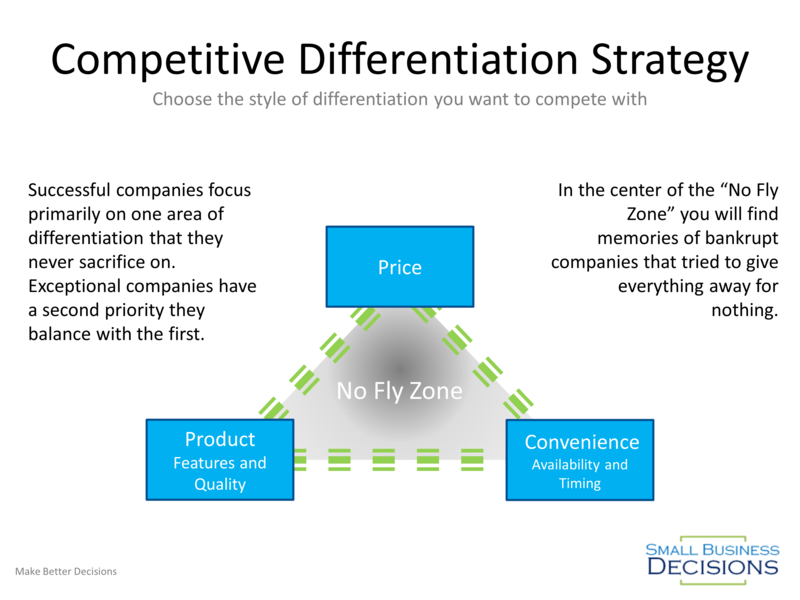 Each method of competitive differentiation justifies differences in what method you choose to set your prices. This roadmap highlights which methods fit with which differentiation strategy. Price differentiation is based on being the lowest cost leader. It is the easiest to compete on from a sales volume perspective, but it is not the easiest to compete on from a profitability perspective. That distinction is incredibly important and why it is critical to ensure that you are a price leader because you truly have cost leadership, rather than being a price leader purely because you have the lowest margins. If this is your method of competition, then having excellence in cost management and Market-Based Pricing is your key. In order to ensure that you make as many sales as possible, you have to know that your prices are the best in town. Ideally, your prices would be at or just below your competition. Cost-Plus Pricing is a great place to start if you truly want to always just have a certain margin. However, if you truly have the lowest cost in the market, you may be able to make more profit by charging a market-based price without risk of losing sales volume. You won’t find much benefit in Value-Based or Differential Pricing for this segment, so don’t worry about them. There is much less effort in getting a sale based on saying you have the lowest price than there is in trying to communicate the value of your product compared to another product. Making a sale based on price generally takes a less skilled sales staff than having to convince the buyer of the value of a higher priced offering. Figure 4. 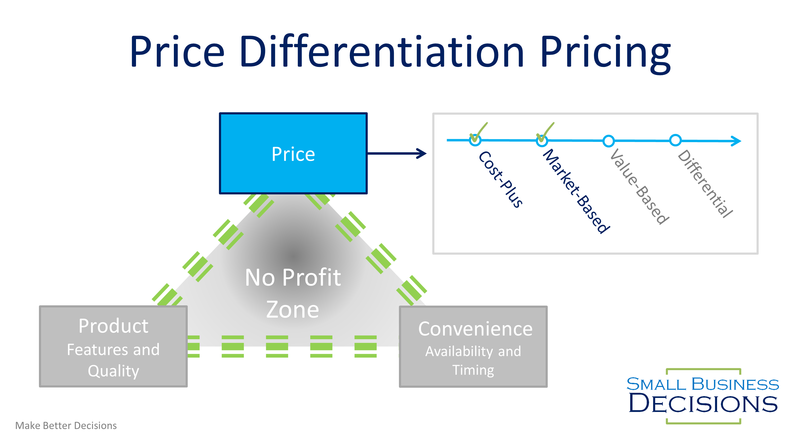 Price Differentiation Pricing should focus on Cost-Plus and Market-Based pricing. Product differentiation is focused on the unique and unparalleled value that your product brings to the market. Your product competes on features and customer value generated because it is one of the few products that does what it does. You create incredible amounts of value and can capture a great amount of that value because the next best alternative to your product is just inferior. In some rare cases, you may find that differential pricing has some benefit, so I’ll add an asterisk there. But that won’t be the norm. Product Differentiation will see the highest profit benefits from an excellent Value-Based Pricing exercise. Figure 5. 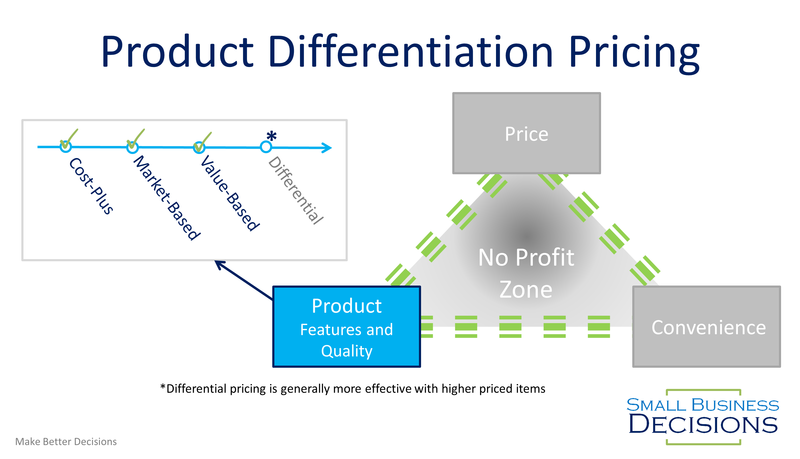 Product differentiation pricing should spend most of their efforts in market-based and value-based pricing where the features of this product are superior to the next best alternative. Convenience Differentiation focuses on the benefits of your product to the individual user. The customer base who is willing to pay for convenience is more likely to be split along the discretionary spending scale. Most customers who pay for convenience either have the luxury of paying for it by choice or have some massive Value-Based incentives for paying for convenience. Convenience is the most likely to include luxury brands and focus on individual sales of highly profitable items or services, which is why there is such potential for Differential Pricing in this space. Differential Pricing, Value-Based Pricing, and Behavior-Based Pricing have huge roles to play in this space. Differential Pricing is generally best for products with $1k or higher price points, have highly skilled salespeople working one-on-one with customers, and have prices that are somewhat flexible. In some cases, Differential Pricing may work in highly automated sales processes which can collect specific information on the customer before presenting a price. Figure 6. 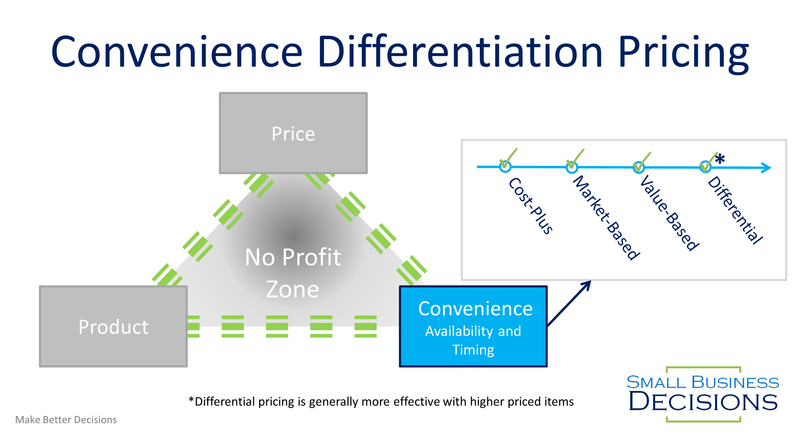 Convenience Differentiation Pricing should focus on Value-Based pricing and differential pricing if it is possible. These methods will provide a huge amount of profit potential in the convenience space. Go and try the pricing methods that apply to your differentiation segment. You can learn a lot about your market in many of these. Often times a great pricing effort will not only increase profits but improve how you deliver value to your customers.